Skylight 47 was launched on 24 January 2013 in Galway City Library and was immediately acclaimed as a new way of reading poetry in the west of Ireland. Its tabloid format gives space for poems to breath, and space for artwork in between. 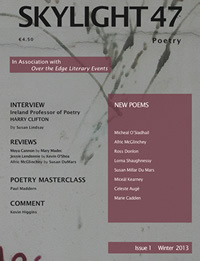 There is an interview with Harry Clifton, Ireland Professor of Poetry, reviews, comment and a poetry masterclass with Paul Maddern. Plus, of course, a gorgeous selection of poems from new and established writers. You can buy a single copy or take out a subscription using PayPal by clicking here. You may need to scroll down one item on the Over the Edge blogsite. Single issue €4.50 plus postage. 2 issues €7.99 plus postage. If you’d like to take out an advertisement we’d be delighted. For information and rates email skylightpoets47@gmail.com with subject ‘Advertisement’ or tel. 353 91 776881.